Danielle's autistic son Max has always presented a bit of a challenge to his single mother, but they've always had a close relationship. Now that he's a teenager, things are getting more difficult. So she decides to bring him to the best pediatric psychiatric facility for evaluation and diagnosis. But instead of making things more clear, Max's admittance to Maitland seems to make things worse. Danielle doesn't believe the staff when they tell her about his behavior, and they think she's in denial. Then Max is found next to a murdered patient. What follows is a thriller that leads Danielle on a path to save Max and prove his innocence, even though the evidence against him looks very bad. With Saving Max, Antoinette van Heugten has weaved a thrilling story that kept me turning the page to see if he really did it...at least once I got to the murder. Unfortunately, it doesn't happen until about a third of the way through the book, so I spent those first 100+ pages waiting for it to happen. After that, things picked up and I had a hard time putting the book down. The only issue I had was the gory details about the murder and about other events that are relevant to it. As a mother, I found some of the details especially difficult to read. It actually made my stomach turn in a few places. I just wasn't expecting that so I wanted to mention it here. Otherwise, it was an interesting thriller with lots of courtroom drama as well. Just be forewarned if you have a weak stomach. 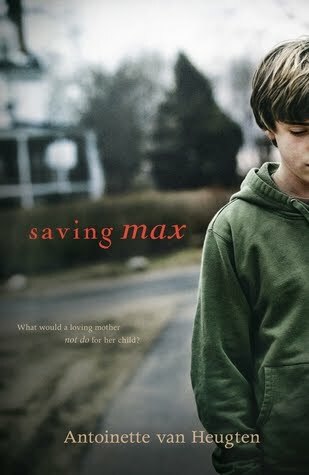 This review was written based on a copy of Saving Max that I received from Phenix & Phenix Literary Publicists in exchange for an honest review. Those scenes were pretty bad. I would definitely agree with that, but overall I thought it was a pretty powerful read.